“Fake news” or just opportunistic spam? THE EPO scandals have been mostly ignored by the media and there are reasons for that. In the US, like in Europe, patent news sources got dominated by few publishers that merely repost shameless self-promotion of patent law firms. This is a problem. It’s an agenda-setting, perception-warping exercise. They merely promote patents and conflate these with “innovation”, “assets” etc. That’s marketing pitch and it’s not being fact-checked. “Patent Analytics Software Aistemos Secures £3M in Series A Funding,” said this headline a few days ago. We’ve been seeing headlines of this kind for quite some time and many so-called ‘news’ sites about patents have placements for companies, so-called ‘news’ about hirings (it’s actually marketing), and sponsored ‘articles’ with phone numbers and E-mail addresses in them (to attract business). “Is everything just “public relations” now?”This isn’t journalism. Not even remotely. But IDTechEx went even further and created a whole site that’s posing as a news site. Printed Electronics World posts pure spam from Bryony Core. There was a press release with an almost identical headline on the very same day. This isn’t “article” or “journalism”, it’s more like entryism for salesmanship (entering news feeds to front for a company). 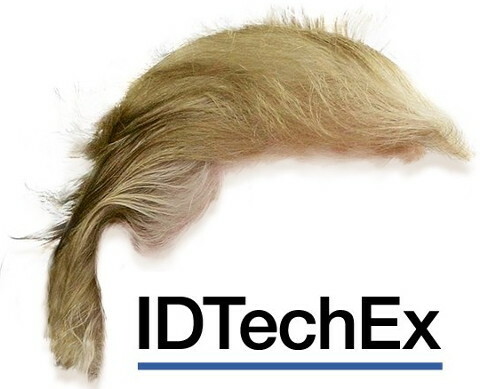 It says at the top “Hosted by IDTechEx” (to sell products for IDTechEx). It looks/seems to be a corporate site disguised as a news site — the very type of thing we object to because it puts patent ‘businesses’ at the driving seat of “the news”. AS observers of the US patent system we typically keep track of pertinent patents that we believe pertain to software. Dallas (Texas), where many patent trolls go, recently had new patents listed in “Dallas Innovates”/”Dallas Invents”. This site is about USPTO-granted patents, not about innovation or invention. Quite a few of the named patents seem to be on abstract ideas, not some machinery or chemistry or whatever. Courts around Dallas might actually tolerate such patents, but not the Federal Circuit (or SCOTUS, if it ever comes to that). “Truth be told, Unified Patents does a fine job. If it profits from it, so be it.”A few days later we saw “PatentDallas” ranting about Unified Patents, linking to this blog post from Mr. Gross, who habitually writes for Texan patent trolls like Dominion Harbor — a troll whose patents get targeted by Unified Patents. Truth be told, Unified Patents does a fine job. If it profits from it, so be it. 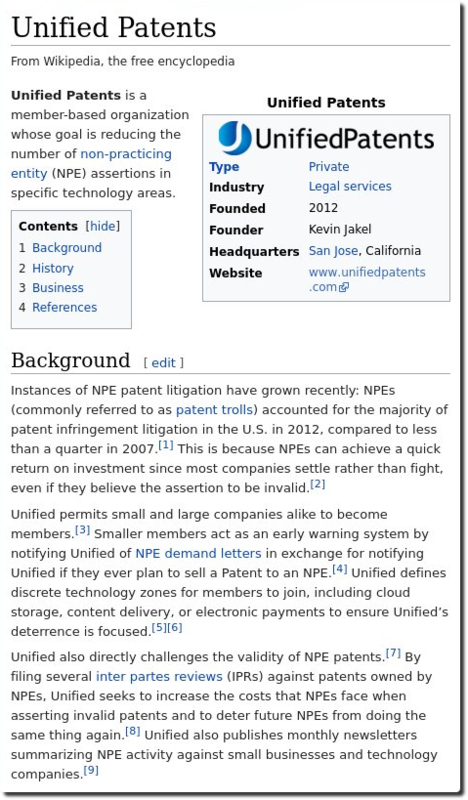 It actually offers bounties for prior art and utilises Alice to invalidate software patents which are prolifically used, typically by trolls. Patent litigation in the first half of 2018 is 15 percent lower than in the first half of 2017. However, the proportion of NPE-related filings remains high, as seen in the figures below. For the first time in this report, we have included litigation data for small and medium sized entities or “SMEs” (Figures 10 and 11). Almost 50% of all litigation against SMEs in High Tech was initiated by Patent Assertion Entities (i.e. entities who purchase patents for the primary purpose of monetization). This is especially troubling since SMEs lack the resources to challenge bad NPE assertions and are often forced to settle rather than risk a protracted and expensive litigation. Part of Unified’s mission is to end invalid PAE assertions against SMEs by 2020. As we said last weekend, the number of US patent lawsuits "Was More Than 50% Higher Half a Decade Ago" and it’s a sign of progress, but the aim should be to reduce troll lawsuits specifically. Not all patent lawsuits are without merit. US patent litigation continued its slide in the first half of 2018 with 1,660 new suits filed, a 15% drop from the first six months of 2017. The data, which was released late yesterday by Unified Patents, suggests that infringement cases are in long-term decline from their most recent high in 2015. That is a reflection of the much tougher legal climate that patent owners now face in bringing cases in the US as their IP runs the possible gauntlet of challenges over patent eligible subject matter in district court and inter partes review (IPR) at the Patent Trial and Appeal Board (PTAB). While they remain very active in the high-tech space, accounting for the vast majority of new cases filed in that sector, Unified’s numbers do reflect the much-reduced threat that companies now face from NPEs. While there are some signs that conditions in the US are improving for patent owners, it doesn’t appear that we’re going to see a return anytime soon to the sky-high litigation rates of just a few years ago. THE staff of the EPO is partying this weekend. We probably won’t comment on the EPO until Monday, which is the first working day for António Campinos (presumably with a 5-year term/position and possible extensions to that). On 29th June, 2018 the decision of the Hungarian Constitutional Court was published on the Court’s website following the Hungarian Government’s motion for the interpretation of the Hungarian Constitution (Basic Act) in relation to the ratification of the UPC Agreement. Today the Constitutional Court ruled that the UPC Agreement as an international agreement made in the framework of enhanced cooperation deprives the Hungarian courts from having competence for judicial review on a group of domestic legal disputes of individuals. As such right for judicial review is exclusively reserved for Hungarian courts under Article 24 (2) of the Basic Act, the UPC Agreement cannot be ratified based on the current wording of the constitution. So there we go. Other sites brought up Bulgaria and Romania. But Hungary is a lot more critical, based on various criteria including the number of European Patents. As proper journalism is basically dead/dying (for various reasons), UPC news is not covered by the mainstream if at all, except by patent maximalists; most of the discussion about it is in social control media, with perhaps hundreds of bits of input. So we’ve seen lots of these and picked a subset of what’s relevant or what was seen by more people. Our intention is to show readers the crooked mindset of Team UPC and even some voices of reason within it (telling the more radical among them to quit spreading misinformation). 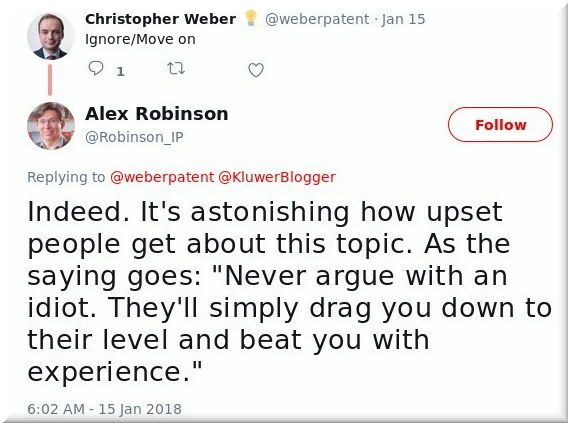 “Our intention is to show readers the crooked mindset of Team UPC and even some voices of reason within it (telling the more radical among them to quit spreading misinformation).”Let’s start by examining coverage from the Team UPC-dominated Kluwer Patent Blog. An anonymous member of the blog now covers — and of course spins — the latest major setback for the dying UPCA ratification effort. Remember that comments which dissent against UPC are blocked or suppressed; they implemented such a policy some months ago. Last we checked there were no comments on this blog post, so their narrative/framing cannot be challenged. How convenient. Romania and Bulgaria got closer to ratifying the UPC Agreement this month, but Hungary’s Constitutional Court ruled the UPC Agreement cannot be ratified. Romania and Bulgaria aren’t relevant to any of it; only Bristows kept obsessing over it. There are even worse things than these. The UPC is absolutely crazy! To think that it ever got close to fruition makes one wonder about Europe’s (mal)functioning democracy. UPC is just a wishlist of the litigation industry, patent trolls, and the most aggressive monopolists that aren’t even based in Europe! That’s not at all what we consider to be patent maximalists; Robinson got it all wrong. As for him, we regard him to be “Team UPC” — a whole ‘nother level of patent zealotry (almost on par with Bristows’). These are people who not only lie routinely but also advocate breaking nationals laws, violating constitutions etc. What on Earth is he talking about??? “As if merely having a translation of the decision will change the decision itself; they’re just looking for ways to nitpick, spin and take it out of context, that’s all…”These people are nuts! Bristows is patently delusional!! Edward Nodder from Bristows now pretends that they can get around the courts; all they need to do — wink wink! — is rewrite the Constitution! Just for the UPC. Just wow!!! “There is a similarity here between Team Battistelli and Team UPC, which seems to believe that it is above the law and whatever sick ends (litigation profits) always justify the means.”This defeats the very purpose of a Constitution. If one can just change it to adapt to anything that’s against it, then what it the essence or purpose of such a Constitution in the first place? There’s a lot of literature about this topic, even TV shows. Again… wow! There is a similarity here between Team Battistelli and Team UPC, which seems to believe that it is above the law and whatever sick ends (litigation profits) always justify the means. Most countries did not even check constitutionality, but there too the UPC is totally not Constitutional. In fact, we thought about filing a Constitutional complaint in the UK, but with Brexit it’s already dead here, so ratification was merely a “PR show” on “World IP Day”. “Most countries did not even check constitutionality, but there too the UPC is totally not Constitutional.”“No panic,” he said, just like an Iraqi communications minister.